The clouds, they’re coming! The days are getting shorter, the weekends are filling up with football, and the bright, colorful fruits of summer are transitioning into the earthy mushrooms and meats of fall. You’ve already eaten all the ice cream and tasted the best burgers in town, but don’t give up just yet. Before you’re ready to say goodbye to cold noodles and picnic dinners, we’ve got a few meals that you’ve just got to get in before the end of summer. The Cronut™ is so 2013, and even the cretzel is more than a year old. This might not have as catchy a portmanteau-based name, but the croissant crossed with an everything bagel rivals its more cleverly named friends for best hybrid pastry. 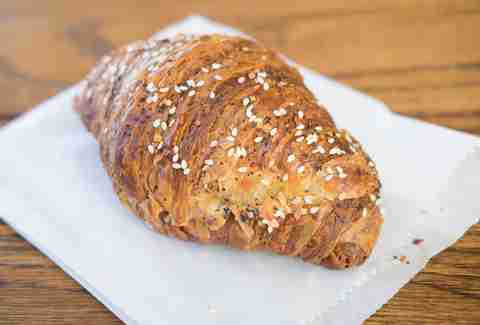 The crispy croissant is sprinkled with the spices from an everything bagel, sliced open, and spread with cream cheese before being closed back up and put on sale. 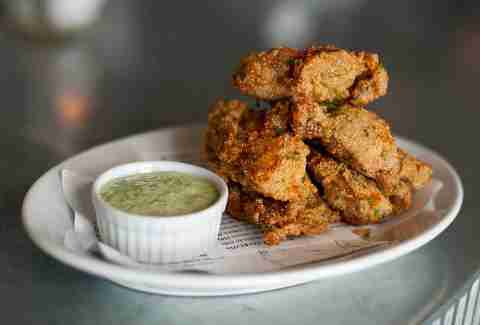 Pull up a chair at Walrus’ airy outdoor seating area and order a plate of the most gluttonous way to eat bivalves: deep-fried and served with a side of cilantro aioli. Japan meets the Northwest in this unique summer specialty. Though it comes out looking like a composed Cobb salad, hiding underneath the chunks of salmon, slices of scallion, strings of cucumber, and cubes of tomato are thick house-made spinach noodles. 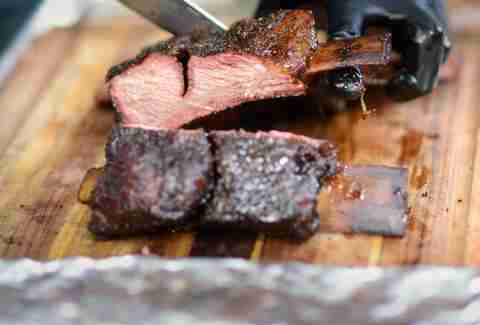 The whole lot comes dressed in a slightly sweet sauce, ready to be mixed, slurped, and savored. Ellenos is to other yogurt what Simone Biles is to other gymnasts: sure, they’re competing in the same sport, but they’re not playing the same game. Other yogurts are flip-flopping around in containers on grocery store shelves while Ellenos is sticking the landing in an open-topped cup, served up like an ice cream sundae for you to eat as you browse around at Pike Place, the U-District farmers market, or their other storefront locations. Poke, the Hawaiian-style raw fish salad, has taken the summer by storm, and you don’t want to miss your chance to stand in line at a mini mart to taste what’s in your Instagram. Also, it’s fresh, cool, and healthful. Like summer… but more tangible, and in a bowl. When The Seattle Times announced the best fish & chips in town, the only people protesting were those who hadn’t yet availed themselves of Nosh’s beer-battered bounty. The only thing keeping these from being a perfect carbon copy of what you’d get at a British chippy is that they’re better. 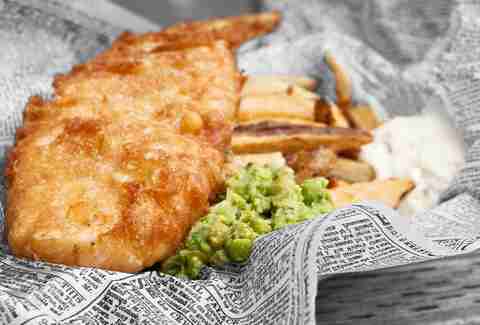 An impeccable Pacific cod fillet, minted mushy peas, and big fat fries, all wrapped up in faux newspaper. If you think about noodles when you hear “Thai street food,” you’re doing it wrong: we’re talking ice cream now. SUSU brings the streetside treat to Seattle, pouring an ice cream base onto a flat griddle, then scraping it off in scrolls and adding creative toppings. In the S’mores Fun, you’ll get graham cracker, chocolate syrup poured over top, and a garnish of shaved chocolate and marshmallows. Just like camping, but with 100% less burnt marshmallow, dirt, and bears. 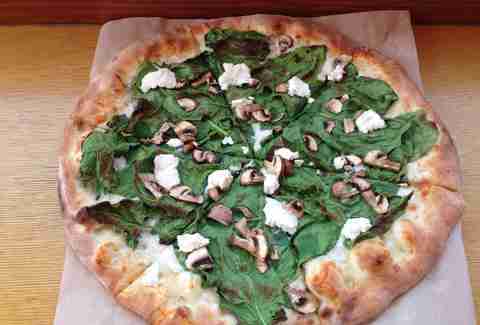 If we were this pizza, humble is the last thing we’d be. It comes with prosciutto, pulled pork, and bacon, plus it's served at a place with ample outdoor seating and picnic-style benches, making it the perfect summertime hang. Say hi to the chickens that live in the coop (and supply eggs to the restaurant) while you’re drinking local beers and waiting on your pie. There’s no more avoiding it: if you’re going to live in Seattle, you’ve got to try a geoduck. Yup, that giant clam with the funny name that nobody can write about without mentioning its resemblance to male genitalia. Good thing in addition to being weird, it’s delicious: clean, crisp, imbued with the essence of the ocean. Amazing when drizzled with shiso oil and served with lemon zest, as it is at Taylor Shellfish’s oyster bars. Put it on your calendar (Tuesdays only). Set an alarm (it starts at 5pm). Don’t be late (they run out). Come hungry (they’re about the size of a toddler). Order a Shiner Bock (it’s basically Texas here). What happens when a steakhouse re-invents the French fry? Something close to what would happen if a McDonald’s hash brown and a steak fry had a baby, but that baby had an X-Men-like genetic mutation that gave it super powers. In the somewhat paraphrased words of local hero Sir Mix-a-Lot, these fries are long, strong, and down to get their flavor on. The noodles might be in the name, but the experts agree on the lamb salad as the sleeper hit. 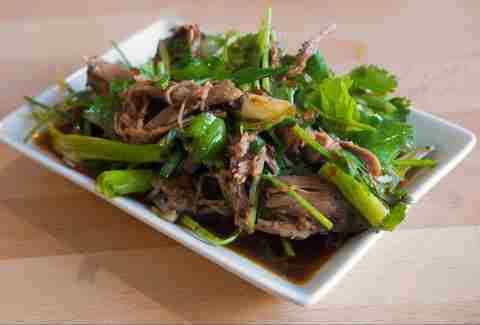 Thin slices of meat marinate in a pepper-spiked sauce that will get you heated, before the crunchy scallions and cooling cilantro chill you back out. 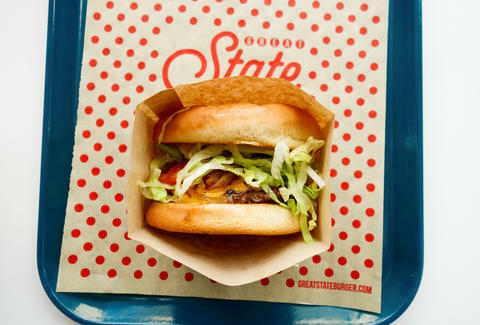 Our national burger correspondent named this one of the best burgers in town, and called the topping the “most tangy American cheese [he'd] ever had.” He declared it a great all-around fast-casual burger, and we couldn’t agree more. But while he was focused on the burger, we’ll add that you don’t want to miss the crispy crinkle-cut fries or seasonal shakes, either. I’m sure that Sushi Wataru’s table service is lovely. I’m sure that the guy off to the side, practically in the hallway between the sushi bar and the kitchen, is doing a fine job of turning out the sushi that you order -- even the version of omakase listed on the menu. I’m also sure that it’s nowhere near as good as what we’re getting at the counter, where the chef makes each piece, handing them over one by one, composing a symphony of flavors, playing with our palates, and giving a spiel on each piece’s origin and preparation.